Anyone that knows me knows that I very rarely stick to a recipe completely. Half way through cooking something I am already thinking of changes that I would make and usually end up altering the recipe somehow. Well, this is not true when it comes to delicious cheese bread. I did not make one change, followed the entire recipe completely and well, it was amazing. It is a keeper and will be made over and over again. The Pioneer Woman is my favorite cooks and I have 2 of her cook books. I have made a lot of her recipes and have never had one that I didn't like. 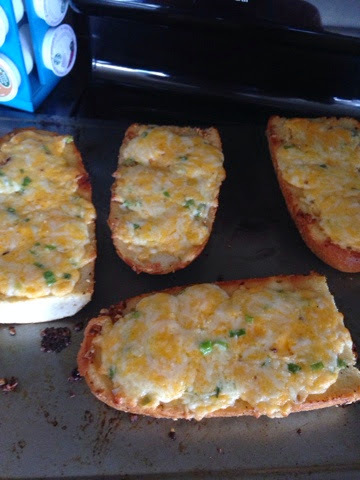 So, here is the link to this amazing Garlic Cheese bread. I highly suggest going to the store right now and getting everything to make it. I also copied and pasted the recipe below. Mix cheeses with the mayonnaise and the green onions. Add dash of salt to taste and set aside or keep in fridge until you need it. Cut loaf of bread in half, then each half into half again. Working 1/4 loaf at a time, melt 2 tablespoons butter in a skillet and add 1/4 of the minced garlic. Place 1 of the 1/4 loaves face down in the skillet, swirling it to soak up the butter and garlic. Allow bread to toast in the skillet, removing garlic if it starts to get too brown. Repeat with remaining butter, garlic, and bread. Spread cheese mixture on warm loaves and bake in a 425 degree oven until cheese is hot and bubbly, about 10 minutes.